The Parish of Coddington is very ancient having first been created in the time of Honorious who was Archbishop of Canterbury in 627 A.D. It originally consisted only of the township of Coddington, meaning town of cottages and was made up of three manors. Over the centuries Aldersey, Beachin, Chowley, Barton and Clutton have been added. The Saxon owners of the three manors are thought to have sided with King Harold against the Norman invaders and as a result the were dispossessed and their titles and land were given to the newly created Earl of Chester, Hugh Lupus. The parish is recorded in the Doomsday Book and in 1093 the patronage of the parish is recorded as being in the possession of two brothers, Hugh and Ralph de Arscio who were respectively Hugh Lupus' chamberlain and butler. From 1098 the patronage was held by the Abbey of St Werburg at Chester (who would have supplied a priest for the parish). At the time of the dissolution of the monasteries under Henry VIII the patronage was transferred to the newly formed Dean and Chapter of Chester Cathedral who remain today as joint patrons with the Duke of Westminster. The first church was built between the 8th and 10th. Centuries A.D. It was built of sandstone, was roofed with thatch and had a central bell tower. Omerod, the great Cheshire historian described it as a "Low mean building of red stone surmounted by a wooden bell tower, the side aisles being divided from the body of the church by three highly pointed arches resting on cylindrical pillars with capitals". This church was found to be unsafe and was demolished in 1833 and the present church was then built in 1833. It is described in Pesvener's Cheshire. Buildings as a Commissioners Church with unusually deep two light windows". It cost £1314 of which £500 was donated by local landowners with other contributions coming from outside subscriptions and societies, whilst the tenants on the estates carted materials free of charge. The first recorded Rector is Hugo de Cestra who , was in post before 1281 A.D. An authoritive list commences in 1281 with Robertus de Pulford. The Rector until the 1950' lived in the old Rectory adjacent to the church. This was rebuilt following a disasterous fire in 1820 which destroyed most of the parish records. In recent times the Rector has lived at Farndon of which he is also Vicar. In the church are many memorials to two families, the Massies and the Alderseys. The Massies were for many centuries Lords of the Manor of Coddington and occupied Coddington Hall, long demolished. William Massie bought the land in Coddington in 1483 and later bought large amounts of land between Broxton Hills and Chester as well as part, of the city itself. Today there are no members of the Massie family connected with the church. The Alderseys were, until the death of Mrs Aldersey, still very much connected with the church and the Aldersey family pew was regularily occupied. The Alderseys were Lords of the Manor of Aldersey and occupied Aldersey Hall which was demolished in recent times. Their links with the parish go back to Hugh de Alteribus who came to this area at the time of William the Conqueror. In 1384 records show that Hugh de Aldersey, Lord of the Manor of Aldersey gave directions for his burial in Coddington church. Above the pulpit hangs a large hatchment bearing the Aldersey coat of arms. Records of the parish show that it was very musical having unusually six books of music. Until the mid 19th. Century the worship was accompanied by a band of a variety of instruments but this was then replaced by an harmonium and a choir was trained which was reportedly of a very high standard for a rural church. Each year the church keeps a special festival called Rushbearing. It is observed on a Sunday near to St. James' Day (25th. July). The custom is to decorate the grave with flowers and rushes and to hold special services in church. It is a survival of ancient times when parishioners brought rushes to make a flooring for the church and they were exchanged at this time of the year for fresh ones. At the west end of the church is the porch erected in 1914 as a memorial to Canon F. Royds who was Rector from 1855 to 1904. At the west end is the stone belfry containing one bell made by Dobson of Downham in Norfolk In 1825. There is also the clock made by Joyce of Whitchuch and installed as a memorial to the men of the parish who fell in the First World War 1914-18. There is a plaque listing the names of the fallen in that war and the name of Edward Huxley, who died in the Second World War 1939-45, it is next to the stairs to the gallery. Entering the church by the West door we pass under the gallery which bears the crests of the Bishop of Chester and local notable families. It contains a two manual pipe organ by Willis. Facing you as you enter the church is the East window given in memory of Samuel Aldersey of Aldersey Hall who died in 1855 aged 78 years. The South East window is in memory of Hugh Robert Aldersey (who laid the foundation stone) who died aged 20 in 1848, both these windows are by Wales. The third window is by Frampton in memory of Canon Royd's son, a lieutenant in the Royal Navy who was died of wounds a 1884. The ceiling is of panelled plaster and where it meets the walls it is embellished with carved angels holding heraldic shields. The altar was given in 1912 in memory of Albert Lowe and the carved oak reredos was also given in 1912 as a memorial to Catherine Hughes a spinster of Coddington. Near to the altar hangs the alms dish dated 1610 and represents Joshua and Caleb carrying bunches of grapes. The communion rails date from 1833 and have iron panels containing the arms of the Aldersey family. The processional cross was given in memory of John James Rutter, churchwarden from 1917-26, whilst the litany desk was given in memory of Thomas Moore, Rector's warden for 55 years and his wife Mary Ellen who had been Enrolling member of the Mothers' Union. The brass lectern was given in memory of Lucy Aldersey who died in 1868 whilst the pulpit was made from old be pews after they were dismantled in 1884. It has the typical linenfold panels of the early 16th century. Near to the pulpit is the brass plaque listing members of the Massie family, former Lords of the Manor, who are interred in the Massie vault which lies underneath the vestry. There are other Massie memorials on this wall and here hangs also the Aldersey family hatchment bearing their coat of arms. In the vestry on one wall is the Massie coat of arms carved in stone and painted in heraldic colours. On the opposite wall is a memorial tablet to Edward 0 Lewis M.A. Rector of Waterstock, who was the son of John Lewis of Aldersey who died in 1784. At the west end of the church are two bibles one a breeches bible and the other a Bishop's bible. The Breeches bible dates from 1583. During Elizabethan times was chained to a desk. It was restored to the church in 1908, having been lost for 230 years. Also at this end of the church is the octagonal font which was new when the church was rebuilt and cost £5.6.0 (£5-30). There is the old parish chest in which valuables and documents belonging to the church were originally stored. ln this corner there is the funeral bier on which the coffins of those brought to the church were placed. Near to the war memorial is the children's corner donated in memory of Hugh Brickland aged 12 by his parents To the south east is the Aldersey pew. It is surrounded by memorials of the Aldersey family and was occupied until 1996 by a member of the Aldersey family. A Roman by birth, Honorius may possibly have been of those chosen by Gregory the Great for the original evangelization of England, though a member of the second party of missionaries, sent in AD 601, seems likely. At Lincoln, in AD 627, he was consecrated, by Paulinus, to the See of Canterbury. When Paulinus, after the death of Edwin, fled before the storm which broke over the Church in Northumbria, he was received by Honorius and appointed to the Bishopric of Rochester. Honorius consolidated the work of converting the English by sending forth St. Felix, the Burgundian, to Dunwich and, probably, consecrating him as the first Bishop of East Anglia. Honorius died on 30th September AD 653. Early careerHugh was the son of Richard le Goz, Viscount of Avranches and Emma de Conteville, and inherited from his father a large estate, not just in the Avranchin but scattered throughout western Normandy. The Avranchin is located on the Contentin Peninsula of northern France, just east of Mont-Saint-Michel; it is among the areas (illegally) granted under the Treaty of Saint-Clair-sur-Epte to Normandy by the Kingdom of France that had previously belonged to the Duchy of Brittany. Hugh became an important councillor of William, Duke of Normandy. His father contributed sixty ships to the invasion of England, his presence on Senlac Hill in 1066 if not proved, was possible. His father remained in Normandy both to protect the duchy and because he was ill, so Hugh may have been his representative at Hastings. Earl of ChesterHugh was given the command of Tutbury Castle in Staffordshire after Duke William became William I of England. In 1071, Gerbod the Fleming, the first Earl of Chester was taken prisoner at the Battle Of Cassel in France. Taking advantage of the circumstances, the king declared his title vacant, giving Hugh the Earldom (of the second creation) The new Earl was also given palatine powers in view of Cheshire's strategic location on the Welsh Marches.] On Hugh's promotion, Tutbury and its surrounding lands were passed to the Norman Knight, Henry de Ferrers, who had also fought with William I at the Battle of Hastings. 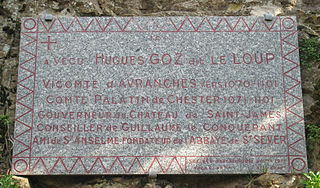 In 1082, Hugh succeeded to the title of Vicomte d'Avranches. During his lifetime, the Earl founded the Benedictine Abbeys of Saint-Sever, Normandy and St. Werburgh in Chester as well as giving land endowments to Whitby Abbey, North Yorkshire. Hugh remained loyal to King William II during the rebellion of 1088. He later served Henry I as one of his principal councillors at the royal court. WalesHugh spent much of his time fighting with his neighbours in Wales. Together with his cousin Robert of Rhuddlan he subdued a good part of northern Wales. Initially Robert of Rhuddlan held north-east Wales as a vassal of Hugh. However in 1081 Gruffudd ap CynanKing of Kingdom of Gwynedd was captured by treachery at a meeting near Corwen. Gruffudd was imprisoned by Earl Hugh in his castle at Chester, but it was Robert who took over his kingdom, holding it directly from the king. When Robert was killed by a Welsh raiding party in 1093 Hugh took over these lands, becoming ruler of most of North Wales, but he lost Anglesey and much of the rest of Gwynedd in the Welsh revolt of 1094, led by Gruffudd ap Cynan, who had escaped from captivity.